Freezer burritos are a staple in our freezer… along with our Seasoned Ground Beef, burritos are one freezer cooking item I try to always have. They make for a quick lunch or even dinner if need be and EVERYONE in this house loves them. Recently we ran out and I resorted to purchasing some from the store… but it just wasn’t the same. We MUCH prefer the homemade version. So, this time around, I made a batch of 40. I also tweaked the recipe a bit. We have made Brown Bag Burritos oodles of times from a recipe we tweaked from Amy’s Finer Things, however, this time I wanted to use less red sauce and add some green sauce along with switching up the spices a bit. We LOVED the result and this will be our new staple. I say they just taste GOODe! The recipe starts with 3 lbs of Seasoned Ground Beef… Browned ground beef, onion and garlic. Add the cheese to the beef over medium heat. I then added 5 (15 oz) cans of refried beans. Mix it all up and heat through. Meanwhile grab 40 12 inch flour tortillas. And give them a quick warm up on a griddle… just until they bubble a little, then just stack on each other to keep warm. Fold over the beans and then fold in sides. Now grab some paper towels. The paper towels help control mositure and keep you from having a soggy burrito. I have used various brands over the past two years and generic ones don’t work as well (they stick). My favorite to use is Bounty Basics. 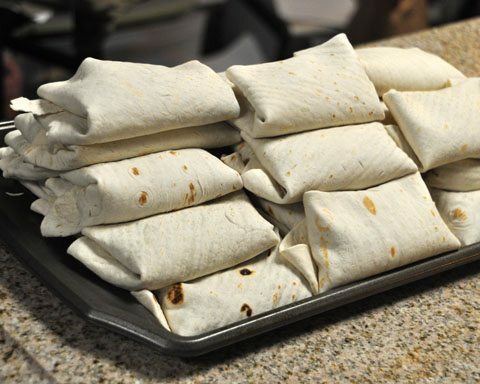 To reheat frozen burrito, remove foil and heat in papertowel in microwave for 90 seconds, flip and cook for 90 more seconds. Immediately remove the paper towel and serve. Taco Bell Chilli Cheese burritos are my favorite and my loval TB quite serving them so this will for sure be a recipe I will try…can’t wait for more of you freezer recipes. Yum! My son likes to experiment with Burritos…I’ll share your recipe with him. These look great…and so easy to re-heat! Great for a quick meal when time is short..which seems to happen a lot these days! Jewish food that actively thumbs its nose at the laws of kashrut clearly holds tremendous social allure for some. Is veveeta key or can I just use shredded cheddar? Hi Chris could i just do 1/2 the recipe would that be hard for a new cook ? Shouldn’t be too hard. A lot of people have told me they have done half. Have fun!